Those who are fascinated by numbers and the power they hold will find this book a good read. However, the decisive factor that makes this book highly relevant is that it addresses the power behind numbers in the realm of mental health institutions, between 1789 and 1939. In 'Madness and Civilization' (1964; 'Folie et Déraison', 1961), Michel Foucault describes the development of the concept of madness identifying three phases: the Renaissance, the 'Classical Age' (17th-18th) and the modern experience. Porter's current book picks up where Foucault left off. Furthermore, his goal is different. The book's hypothesis is that, in the beginning of the creation of institutions devoted to confine those who were mad in the 18th century (being heredity identified as one of the main causes for mental illness) there was also a massive effort in data collection, organization and classification. Since then, many actors have had a relevant role in data collection in asylums and different motives to do so – purely institutional, purely medical, purely scientific or all of the above. This book is historical in nature but brings precious insight on what lies behind what we now know as genetics. Just like today its main focus is on genes, DNA and Big Data (which raises both scientific enthusiasm and serious ethical problems), back then it was heredity. The challenges taking place in medical and social institutions then, uncovered familiar problems that remain unsolved up until today. Jan Goldstein's book 'Console and Classify' (1987), another significant book to this field of study, addresses developments in the French psychiatric profession in the 19th century and it is valuable literature. Porter's book also addresses how the psychiatric profession was experienced particularly in the context of asylums, describing its institutional context in France, Britain, USA and Germany. The author addresses scientific breakthroughs, psychiatric practice and asylum development taking place in the four countries. It becomes clear to the reader that a network was slowly created, encompassing first institutions that were located in the same country, and then it expanded including institutions from other countries. They exchanged administrative and organizational procedures, and medical and scientific knowledge. Statistics became increasingly relevant to the point of the emergence of a movement that called for international standardization (proposed first by Ludger Lunier (1822-1897)). To focus on actors and institutions, and how they communicated new findings, is one of the main original approaches of this book in the realm of the history of genetics. The narrative that is put forth by Porter shows us that heredity went from being an institutional problem, to slowly become a medical problem and lastly a scientific problem. Concurrently, these developments lead to the need of more robust collection and statistical analysis. At first, the effort of keeping records seemed to be motivated mainly by administrative reasons. Madness was perceived as a threat to social stability, and to civilization itself, and it needed to be kept under control. It was above all a moral problem and a public health problem. Governments and public funding subsidized these institutions in an effort to protect their countries from unrest and demise. But in order to prove that successful work was being conducted, these institutions had to show proof of their accomplishments. This was done by careless recordkeeping and sometimes by "creative" recordkeeping, where the number of cures was suspiciously high. These results were disseminated among the general population, which took great interest in the situation, and asylums' success reinforced that these institutions should continue to be funded. The problem was that despite a record number of cures, asylum populations continued to grow. Were these new institutions a successful enterprise or not? This was when asylum doctors (instead of administrative personnel) started intervening in data collection and recordkeeping, crafting new resources. The main goal was to relief heredity causes and this also deeply impacted diagnostic criteria. It was relevant to distinguish the reasons why people went to the asylum, what set of characteristics/behavior did they exhibit and what was the possible solution/cure. Ideally, the relevance was the possibility of establishing a cause-effect relation in which a specific set of causes responded positively to a specific intervention/treatment. The situation became a matter of scientific discussion when two schools defined different approaches to diagnostic (and consequently to possible cures): the Mendelian school (Gregor Mendel, 1822-1984) and the biometric school. Briefly, the Mendelian school was a data science that explained human traits with a genetic factor and took particular interest in the reproduction of the mentally ill – which should be avoided; biometry was a scientific approach proposed by Francis Galton (1822-1911) (and supported by Karl Pearson and Raphael Weldon) that took heredity on a scientific basis by applying novel statistical concepts being the main goal to establish a correlation between traits. Galton propelled statistics to new heights by applying his new findings in the field to meteorology (the anti-cyclone and the first popular weather maps), statistics (regression and correlation), psychology (synesthesia), criminology (fingerprints) and biology (the nature and mechanism of heredity). Eugenics, selective breeding aimed at improving the genetic composition of the human race, was a term coined by Galton, which particularly during the Nazi regime in Germany had terrible use. Almost until the end of the 1930s the tradition of heredity investigation based on institutional data and population surveys persisted. A short description of useful concepts used throughout the book is provided in the beginning. For example, under 'madness' we find several distinctions: insanity, lunacy, mental illness, idiot, imbecile, feebleminded, mental deficiency, mental defect and mental weakness. Each was used to refer different diagnosis. Porter's previously published books always deal with statistics and numbers, and how they contribute to shape the world as we know it. 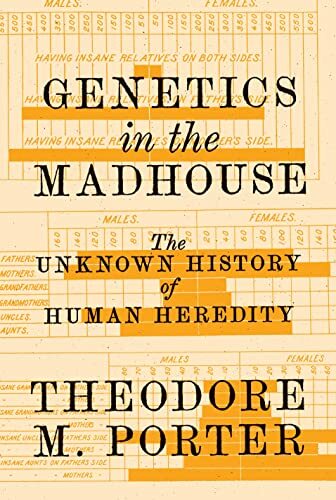 'Genetics in the Madhouse' benefits from that experience and it is a well-written and well-researched book where the author's expertise shines through. It is highly valuable reading for anyone who takes interest in mental health — even to those who may dislike statistics.